In honor of St. Patrick’s Day, Villanova’s Irish Studies Program and Falvey Memorial Library have joined forces to offer a weeklong series of events to celebrate Irish culture. The series, playfully dubbed Nova Feis, will offer a great variety of programming ranging from film viewings and talks to Gaelic football and dance. All events are free and open to faculty, staff, students and the community. So what exactly is a feis? According to the Nassau County Ancient Order of Hibernians, “feis” (pronounced “fesh”) “is an Irish word meaning ‘festival’ and has come to describe a traditional Gaelic arts and culture festival.” It also explains that “Today the Feis has experienced something of a rebirth, both for ethnic Gaels and for enthusiasts of the Gaelic culture in Ireland and Scotland, as well as throughout the world. 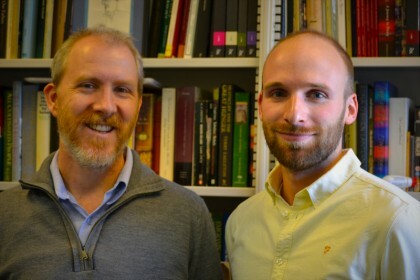 Typically they are community-based festivals seeking to promote and maintain Gaelic Culture, tradition, and pride.” This is a tradition that Joseph Lennon, PhD, associate professor and director of Irish Studies, hopes to continue at Villanova. One of the main organizers of the Nova Feis 2014 series of events is Ciarán Ó Braonáin, a Fulbright FLTA and a visiting instructor who is teaching the Irish language here at Villanova for one year. In a recent interview about the series, he said, “I am very excited about this year’s Nova Feis festival. I think it is hugely important that Villanova recognizes and celebrates its Irish roots and fosters the significant bonds that the University and its students continue to hold with Ireland. Through both student- and faculty-run events, we have done exceptionally well this year in this regard. “To cast a quick glance over some of the highlights of the year so far: we were visited by renowned novelist Colum McCann, conducted a fascinating fall series of events in partnership with Villanova’s Africana Studies [Program], held our annual James Joyce birthday celebration despite threatening weather, witnessed Irish Studies attain ‘minor’ status as a degree component and, most impressive of all, we cheered as the Villanova Irish Dance team organized and hosted the first ever intercollegiate Irish Dance competition. This is the second Nova Feis that has been held in Falvey Memorial Library. The first Nova Feis celebration took place in March 2012 when both Irish Studies and Falvey started their collaboration with a wonderful celebration of Irish culture featuring music, dancing and poetry readings at a single event. This year, we continue this wonderful tradition, so remember to join the craic! Come to our events from March 17-21! See the full line-up of events here.